The conidiophores are united together to form fruiting structures (sporodochia) which are usually flat but may be on a stalk. 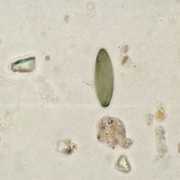 The spores (conidia) are borne from the tips of the long phialides which are in turn borne on densely branched and brush-like conidiophores. 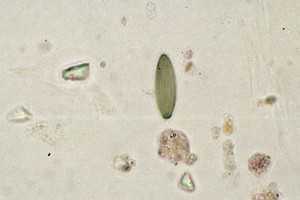 The mass of dark green conidia collect in large green to blackish wet drops. In soil and decaying plant debris. It is also known to produce a variety of macrocyclic trichothecene toxins that cause disease in humans, animals and plants.